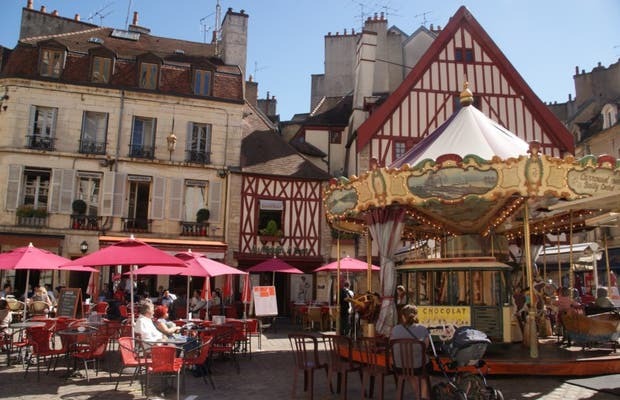 This place is also known as Bareuzai Square, and is a central point in the medieval center of Dijon. The surrounding streets are pedestrian, and it is a very pleasant place to take a stroll, or have a drink. The Moulin A Vent is a very good restaurant in the square which was built in a love old house. I like the outsides of the houses which have wooden pillars which gives them a special charm. The name represents the child Bareuzai, which can be found in the center of the square, who squeezes grapes to make wine. It is a bronze statue that was constructed in the square to commemorate good wine.